This late Victorian two-storey commercial building features rusticated stone piers on the main floor that visually link the building to the ground. On the second storey, architectural highlights include a balustrade cornice and a name plate on the Douglas Street facade in unglazed terra cotta, decorative multi-colored brick detailing and round-headed windows with stone on the upper portions. The building was noted as “among the larger and more costly structures which have been erected … during the year” in the British Daily Colonist of September 14, 1900. The cost of construction was $13,000. The original owner, Robert J. Porter, was born in Dorset, England in 1834. He sailed to Vancouver Island to work for the Hudson Bay Company in a trip that took 6 1/2 months. Once in Victoria, he worked as a farmer, surveyor, brick maker, and butcher. He opened this wholesale and retail butcher shop and later had two shops in Victoria and two in Vancouver. His firm Porter and Sons was eventually purchased by P. Burns & Co. Between 1890 and 1928 Burns built one of the largest packing and provisioning businesses in the world. Robert Porter served as a City alderman from 1912-1916 and 1918, and was Mayor of Victoria from 1919-1921. His family home at 649 Superior Street was designed by Samuel Maclure. 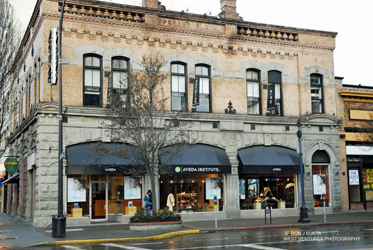 The building has housed many diverse businesses over the last century, but has retained its architectural integrity and is still a landmark on the downtown Victoria streets.